Need to make your desk more organized and fun? Just connect the dots! 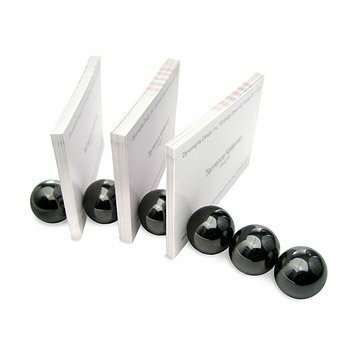 These ultra-strong ceramic magnetic desk dots are perfect for holding business cards, mail, photos, notes and more. Keep them together in a row or pull apart and use as magnets on filing cabinets and other metal surfaces. And when they aren't busy organizing, desk dots are an inconspicuous and entertaining way to pass the time at the office. Designed by Terrence Kelleman. Made in China. Sold as a set of 6. Click here to see how the magnetic desk dots work! Designer Terrence Kelleman seeks to create a vibrant array of jewelry that complements and accentuates the modern urban lifestyle. His innovative, whimsical designs spark fascination and inspiration, as he fosters completely alternative views of traditional concepts. UncommonGoods features two remarkable pieces by Kelleman - the particle necklace and the homme et femme necklace - made entirely of Rare Earth magnets that can be formed into any shape you like. Born and raised in Cleveland, Ohio, Terrence received his formal education in painting, studying at the Cleveland Institute of Art and the Lacoste School of the Arts in Paris. After graduation he returned to Paris and began experimenting with new ways of creating and perceiving art, stimulated by his rich cultural and historical surroundings. He returned to New York in 1996, where his work in painting, photography and video media continued to evolve, exploring issues of gender, identity, and cross-cultural pollination to create radical new designs. In 2002 he began to unveil his line of jewelry. Terrence's work has been exhibited in New York, France, Germany, Italy and Austria. He currently lives in New York City. I use this for my office and it works great. Allows you to be creative in how it is used. These little balls are truly magnetic. I included these in a basket of quirky and unique office desk accessories for one of my husband's Father's Day presents, and he LOVED them. The only downfall is that my five year old, thought they should be toys for her, and due to their small size, we had to keep a very watchful eye. It's more fun to organize with magnets. You only have to make sure not to use near computers, but this is a fun, attractive way to stay organized! We love Neodymium magnets and thought these would be an even larger version but were disappointed to find that they are far weaker than their smaller counterparts. They work fine for their advertised purpose if the papers are light enough. Not too good for science and other projects requiring strong magnets. They sit on my desk at work and home. I use them for post-it's and paperclips. Perfect for an office junkie! I gave this as a gift and they loved it! Bought several for co-worker gifts - great for anyone who needs to "connect the dots" - magnetic balls can be used individually or grouped anyway you like. Well-made - I'm not worried about paint rubbing off. Fun, practical gift. I bought this as a Christmas gift, so I am unable to rate at this time! Ceramic magnetic desk dots are a unique and fun organizing tool for your desk. Hold memos, notes and business cards in place with these powerful magnets.